Though he called Jose Mourinho a "special" manager, Eden Hazard says his philosophy is more similar to Chelsea boss Maurizio Sarri's style. Eden Hazard described former Chelsea boss Jose Mourinho as "special" but conceded his own style is more in line with present Blues coach Maurizio Sarri. Belgium superstar Hazard won a Premier League title and EFL Cup under Mourinho during the Portuguese's second spell in charge at Stamford Bridge. Hazard's relationship with Mourinho reportedly soured towards the end of his tenure, but the forward has spoken of a desire to play under the ex-Manchester United manager again. Sarri has found his own position in the Chelsea post come under increasing scrutiny, particularly since the 6-0 battering at the hands of Manchester City on Sunday. But Hazard accepts the way he plays suits the type of football the Italian wants. 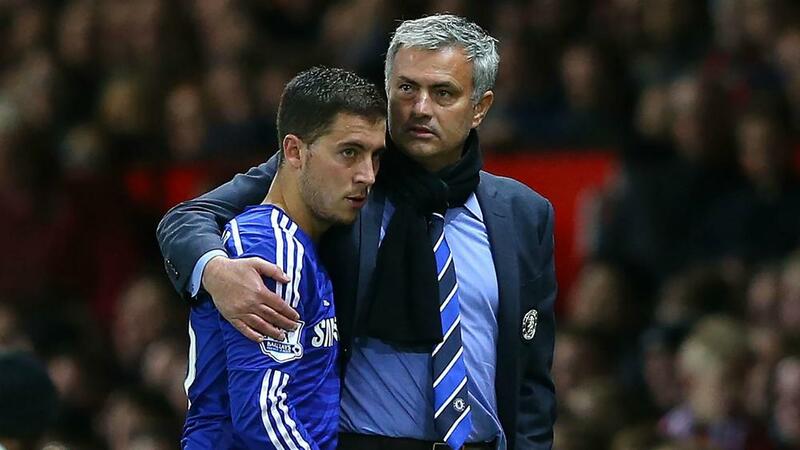 Speaking to Chelsea's official website, Hazard said: "All the managers I've played for have given me something. "Jose Mourinho was special, but the way Sarri and [former Lille coach] Rudi Garcia like to play is more like my philosophy of football, but they've all given me a lot." Hazard was a star turn in the Mourinho team that won the title in the 2014-15 campaign and he retains fond memories from that season. "I won my first Premier League with Chelsea in 2014-15 and I was named PFA and FWA Player of the Year," he added. "It was the perfect season, with collective trophies and individual trophies. It was brilliant. Didier Drogba came back to Chelsea to help us, we won a lot of games, we won the League Cup and we scored a lot of goals. We really enjoyed ourselves and that's why we were champions. "We were champions again in 2016-17. The feeling was the same but the way we won it was fantastic because at the start of the season we had some problems. "We lost against Arsenal and Liverpool and then completely changed the system. We went on an unbelievable run of winning games and at the end of the season you're just happy to win. "For the manager, Antonio Conte, it was special to win the title in his first season."